Colvin & Moggridge » ‘Arts and Crafts’ for the 21st-century. Our renovation of early 20th-century Arts and Crafts gardens around a Hampshire mansion includes a new sunken pool garden. Designed and detailed in partnership with Adam Architects, the semi-circle of balustraded steps and planted landings lead down to sheltered terraces, which contain an elaborate arrangement of rill pools, water spouts and falls. Constructed from a unique combination of Portland, Caithness and York stones, the design is detailed with panels of locally blended Dunton bricks, and ornamented with flints, tile creasing and patterned black and white pebbles. 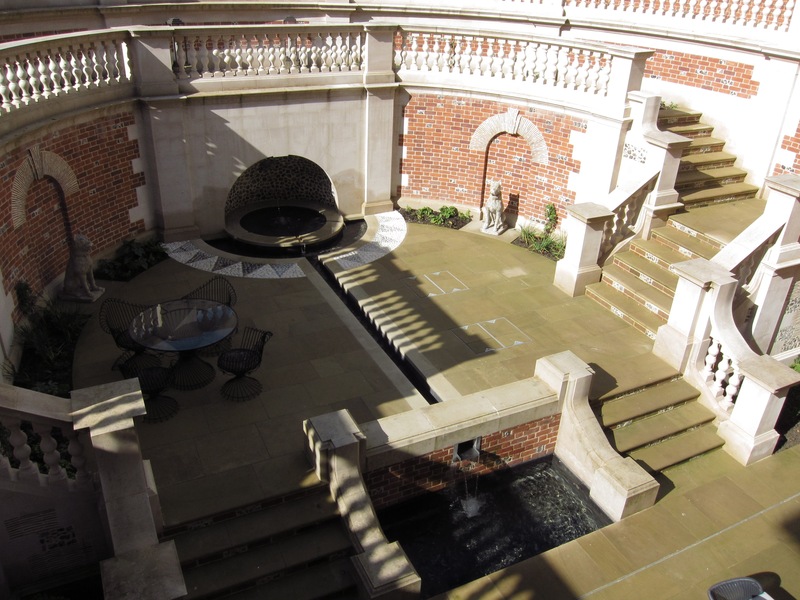 A pair of Parisian stone dogs in niches stand guard to each side of the central, circular recessed pool. This stylish, intensely private space, laid out beyond the mansion’s indoor swimming pool, provides the perfect combination of sheltered sunny terrace and shaded cool corners for elegant outdoor living. Concealed from the surrounding terraces, the new garden exemplifies the finely crafted quality of early 20th-century design, and its audible water features glimmer in daylight and sparkle when lit up at night.